A leader in automotive innovation, Tesla Motors is fueling the sustainable transport movement. 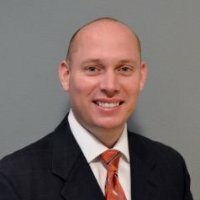 Tesla came to us to help them provide customers with a digital experience. 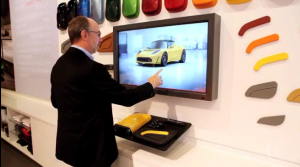 Tesla wanted to approach this with the “digical”, the merging of digital and physical. 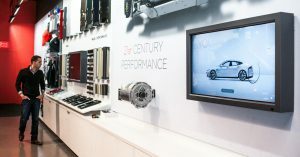 They wanted to provide an interactive experience to teach potential customer about Tesla and end with the Tesla showroom. Tesla needed this interface to be sleek, clean, and mirror their brand using a specific shade of gray. We realized a large format screen would suit them. The only downside was the weight of the monitor; to properly support it requires distracting hardware. We provided Panasonic 85 Inch Touch Screen. We partnered with Premiere Mounts to build a custom bezel to support the weight of the monitor and hide the “behind the scenes mess” to achieve those clean lines. It took us a few attempts but we even matched the gray they were looking for! Unlike a distribution partner we were able to consult and assist with everything from A-Z. In this project we traveled to Tesla Headquarters to help tape out the walls to prepare for the touch monitors. 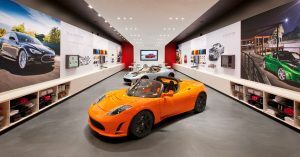 The custom software was handled by Odopod which allows visitors to build their own custom Tesla before going into the showroom. 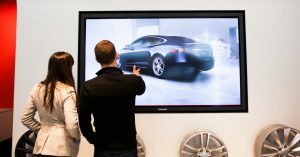 Since Tesla’s touch screen debut, we are seeing more and more retailers implementing digital discovery into their customer experience like Sephora, Lowes, and Nike. We are ecstatic that we were able to assist Tesla in their retail revolution. Unlike a distribution partner we were able to consult and assist with everything from A-Z.